Your Storage Solution! Physically Inspect Prior To Delivery. 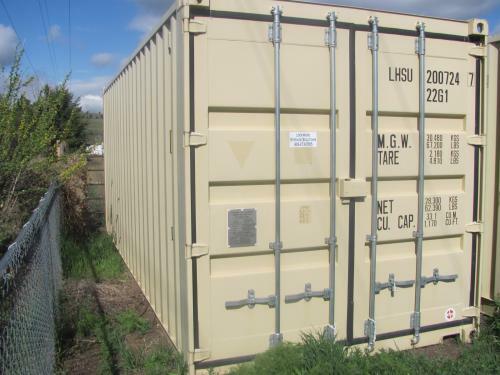 Container Inventory In Montana For Sale Or Rent. If you’re having trouble finding room for all of your belongings, turn to Lockwood Storage Solutions in Lolo, MT. Our self-storage center will provide you with the extra space that you need. We have more than 10 years of experience, and we're a member of the National Portable Storage Association. We also have an A+ rating with the BBB. As a storage center owned and operated by locals from Lolo and the surrounding areas, we’ll work with you closely when we assist you. We’re available Monday - Friday, 8am - 5pm, and on Saturday, by appointment. We’ll eliminate the hassles associated with finding adequate storage options, so contact Lockwood Storage Solutions today. We have been in the storage business for 15 years, delivering containers and previously wooden storage/garden sheds to customers especially focused in the Missoula area for 15 years. We have expertise in getting units delivered!!! I grew up working in my father's cereal seed business then becoming a licensed building contractor, I have 5 children, 2 daughter-in-laws, 2 granddaughters and 1 grandson. We love to hunt, fish, hike, quad and motorcycle ride and all sorts of outdoor activities. We would love to meet your storage needs whether it is renting or storing at our facility for long or short term or selling you a permanent storage unit. We have a wide variety of new and used units in our Lolo yard, and have our own trucks and drivers to control bringing in your specialty units, or getting them to your unique delivery situation on your site. We have been complimented and tipped for getting units into some amazing places in our great mountain state!! We are also continuing to service our customers by offering more solutions, we currently offer PODS, (Portable On Demand Storage) to move the loaded 20' units for our local customers. We have recently purchased a 60,000 lb lift to begin in the near future to accommodate customers who may need a place to unload or load loaded 40' units, with the option of short or long term storage of these units at our 4 1/2 acre site. In future, we are looking forward to offering the movement of loaded 40' units to and from YOUR site. We hope to be a solution to your storage needs! Just received out shipping containers for our business. They showed up right at the time we scheduled and we're just what we needed. Crystal was so helpful and patient throughout our deciding process and for a great price. Would highly recommend this local family run business. Thanks from Cooper Firearms of Montana. © Lockwood Storage Solutions. All rights reserved.